More rain here in Southern California! 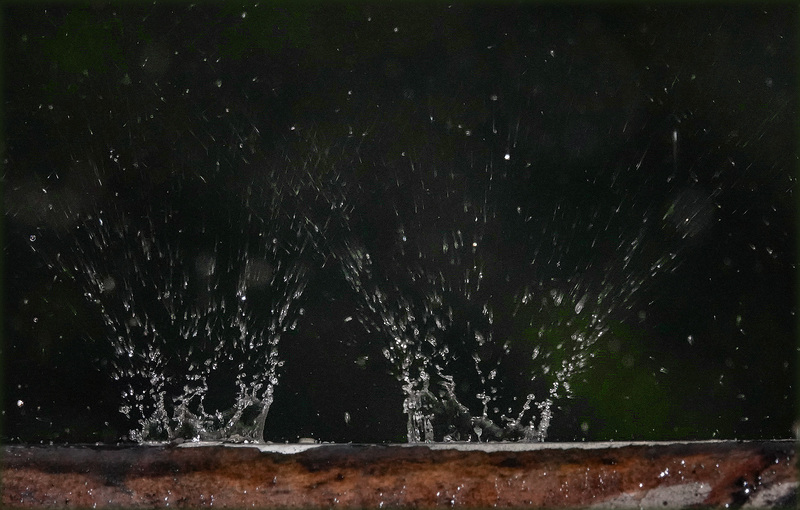 And for the past couple of weeks I’ve been trying to capture a good shot of a raindrop splashing on the fence outside my window. This is harder than it sounds. First off, it turns out that even 1/1000th of a second is barely enough to freeze a splash. But a higher shutter speed, combined with a high f/stop to get some depth of field and a reasonably low ISO to keep the noise under control, only works on a bright, sunny day. But if it’s raining, then by definition it’s sort of a dim, overcast day. Plus there’s the timing. You have to catch the raindrop at exactly the right instant, and there’s no talent or practice that will improve your timing. It’s just luck. Plus you need a good hard rain so you have nice fat raindrops. Anyway, I put my camera on a tripod and kept trying whenever the rain got heavy. I probably took a thousand pictures or so—which sounds like a lot, but probably only took a total of 15 minutes of my time. Nonetheless, I never quite got a really great splash. Until yesterday. It was late in the day, and a natural exposure was hopeless. So I popped up the flash and used that for fill at 1/1000th of a second. I took fewer than a dozen pictures, but by enormous good luck one of them turned out to be not only a great, sharp splash, but a double splash. Here it is. I’m putting it up right away because once it’s up, I’m not going to post another one, and that means I can pack up the tripod and end my raindrop obsession. With this photo, I think it’s over.